In my previous post, I wrote about chasing sunset and the magical scene that the rays of light and persistent sundog created…This is the corollary to that scene…We are in it…We live here…We work here…We persevere here…We laugh here…We dream here. Our essence is consumed by the world that surrounds us and the manner in which we interpret its beauty as we cruise along at 40,000 feet. 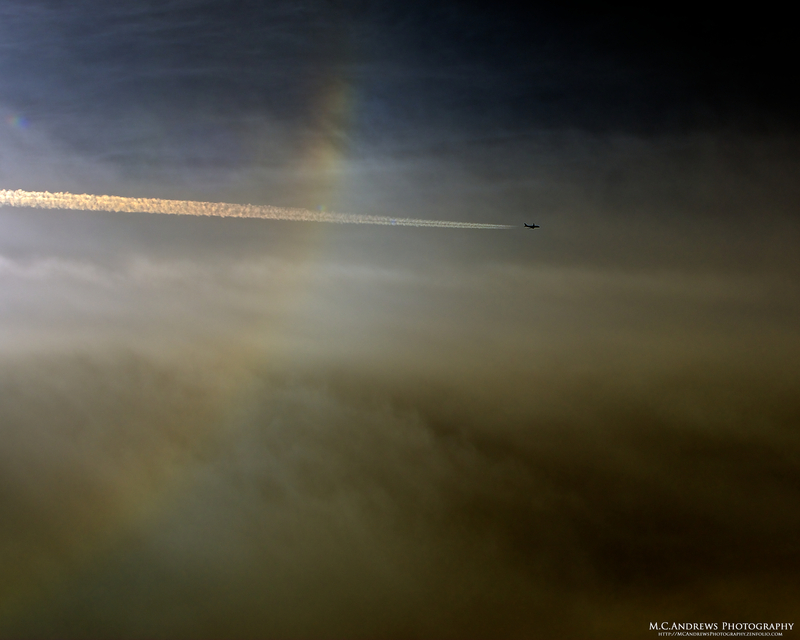 A passing aircraft performs pilot magic and flies through our sundog…his ethereal hoop…and his contrail is illuminated with a pink-golden luster as he touches the rainbow and becomes part of the scene. Did you ever dream of touching a rainbow? The funny thing is that you probably do it all the time and never know it…When the gloom lifts from any storm that surrounds you, just as the sunlight hits your face amid the last drops of water and mist, you are standing in the rainbow…You are just too close and too involved to see it. Get a little distance and have a little faith that for every storm you weather, you end up awash in the light of a rainbow. It’s not really magic, but it is a good secret. Share it with your friends.